Frontier’s March to Oblivion: Bankruptcy In Its Future? Frontier Communications is quickly becoming the Sears and Kmart of phone companies, on a slow march to bankruptcy or outright oblivion. What started as a small independent phone company in Connecticut has grown through acquiring overpriced or decrepit landline cast-offs, mostly from Verizon, leaving itself with massive amounts of debt and infrastructure it is not willing to upgrade. Despite rosy prognostications given to customers and shareholders, few are willing to take Frontier’s word that life is good with a company that still relies heavily on copper wire phone and DSL service. Don’t take out word for it. Just watch the line of customers heading for the exits, canceling service and never looking back. As Frontier continues to lose customers fed up with its bad DSL service, rated even poorer than satellite-delivered broadband by Consumer Reports, its only chance to grow is to acquire more customers through more acquisitions. Unfortunately, after another disastrous transition for former Verizon customers in Florida, California, and Texas, Frontier’s bad reputation is likely to leave regulators and shareholders concerned about Frontier’s ability to manage yet more acquisitions in the future. The Wall Street Journal reports Frontier bet on making it big with rural and suburban landlines, and lost. Frontier’s mess has infuriated shareholders who invest in the stock mostly for its dividend payouts. The Norwalk, Conn. company recently announced it slashed its dividend, causing investors to flee the stock. Shares are down 69% so far this year. In a desperate bid to keep its Nasdaq listing, the company announced an unprecedented 1-for-15 reverse stock split just to prop up its share price. Frontier’s slow hemorrhage of landline customers turned into a flash flood in the spring of 2016 after botching yet another “flash cutover” of customers acquired from Verizon. Verizon’s decision to sell off its landline networks in Florida, California, and Texas (mostly acquired from GTE by Verizon predecessor Bell Atlantic) was good news for Verizon, bad news for Frontier’s newest customers. Frontier hates to spend money to overhaul its copper-based facilities with fiber. It prefers to buy service areas from companies that undertook fiber upgrades on their own dime. Verizon had already upgraded large sections of those three states with its FiOS fiber to the home network. Frontier’s interest was primarily about acquiring that fiber, Frontier finance chief Perley McBride told the Wall Street Journal. Even McBride admitted Frontier failed to do a good job integrating those customers. Consumer Reports rates Frontier DSL lower than one satellite broadband provider. That should not be news to McBride or anyone else. Frontier has repeatedly failed every flash cutover it has attempted. The worst recent examples were Frontier’s botched 2010 transition in West Virginia, where the company inherited copper landlines neglected by Verizon for decades. Customers were infuriated by Frontier’s inability to maintain service and billing, and the company was investigated by state officials after many customers lost service, sometimes for weeks. In Connecticut, Frontier messed up a transition of its acquisition of AT&T’s U-verse system, having learned nothing from its mistakes in West Virginia or elsewhere. The company was forced to pay substantial service credits to residential and business customers that were offline for days. Thus it was no surprise yet another hurried transition would lead to disaster last spring. Regulators received thousands of complaints and a significant percentage of longtime Verizon customers left for good. Frontier CEO Dan McCarthy appears to be even less credible with investors and customers than his predecessor Maggie Wilderotter, who may have retired with an understanding the long term future of Frontier looks pretty bleak. McCarthy has repeatedly put an optimistic face on Frontier’s increasingly poor performance. Jureller is no longer with Frontier. His replacement is the aforementioned McBride, who has a reputation as a “turnaround” expert, usually at the expense of employees. McBride has already helped oversee the permanent departure of at least 1,000 employees, laid off as part of what Frontier is calling “a customer-focused reorganization.” McCarthy prefers to tell Wall Street the layoffs are about reining in costs, despite the company’s profligate spending on acquisitions. McBride told the Journal he doesn’t expect much revenue growth at Frontier anytime soon in California, Texas, and Florida. McCarthy’s grand turnaround plan isn’t working either. 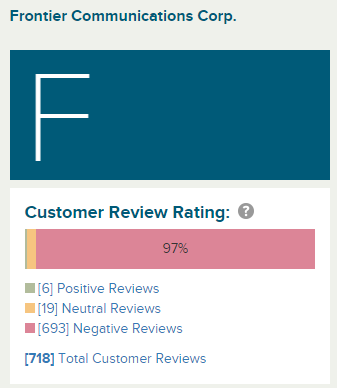 In fact, customer ratings of Frontier are falling about as fast as a rock thrown off a cliff. There is little evidence Frontier will improve its dismal American Customer Satisfaction Index score in 2017. It finished dead last among internet service providers last year, falling 8% despite taking on new customers and allegedly upgrading others. Frontier’s overall grade was second to last across all categories in the telecom sector. Frontier managed to achieve bottom of the barrel scores despite broad upticks in customer satisfaction among other similar providers last year. Verizon FiOS achieved a 7% improvement to a best-ever customer satisfaction rating. In areas acquired by Frontier, as soon as the service was renamed Frontier FiOS, ratings plunged. So has Frontier’s revenue, which continues a downward spiral. The company posted a loss of $373 million last year compared to $196 million in losses a year earlier. It has committed to spending $1 billion on its network this year, but customers uniformly report few substantial service improvements, and many wonder where the money is going. Frontier is also upset that Verizon, in its zeal to make its landline properties in California, Texas, and Florida look as good as possible, stopped collection activity on overdue accounts just before the sale, saddling Frontier with thousands of deadbeat customers Verizon should have written off as uncollectable long ago, but never did. We find a high volume and pattern of complaints exists concerning prior Verizon consumers who have not had a smooth transition to Frontier Communication since Frontier Communications took over various Verizon customers on April 1, 2016. Consumers have reported that services did not transition properly: many do not have services or are having spotty service with outages; many internet issues, from slow speeds to complete outages, consumers advise they are paying for certain levels of internet speeds but are not receiving those levels. Cable issues including missing networks, movie on demand concerns, issues with purchased subscriptions not carrying over, titles consumers have paid for (purchased licensed for) not being uploaded to their libraries and no solutions are being offered; and inability to access items like DVR boxes at the same time (multiple boxes in households not functioning); the Frontier App is not functioning for consumers; not fulfilling the rewards advertised with new service signups; charging consumers unauthorized third party charges on their telephone bill and not properly applying credits to consumer’s bills or consumers not being able to login to pay their bills. When consumers call to receive assistance many report to BBB that they are hung up on or calls are disconnected and [are not followed up] by Frontier representatives. Consumers are transferred from representative to representative without receiving any assistance to their concerns many times resulting in a disconnection. Per Tariff, in no event shall Frontier be liable in tort, contract, or otherwise for errors, omissions, interruptions, or delays to any person for personal injury, property damage, death, or economic losses. Frontier shall in no event exceed an amount equivalent to the proportionate charge to the customer for the period of service during which such mistake, omission, interruption, delay, error or defect occurs. Frontier will apply a credit based on the customer’s daily service rate. We trust that this information will assist you in closing this complaint. We regret any inconvenience that ‘consumer name’ may have experienced as a result of the above matter. The business did not respond to the pattern of complaint correspondence BBB sent. “Cable companies are beating the pants off Frontier,” Jonathan Chaplin, an analyst for New Street Research, told the newspaper. Heavy targeted marketing of Frontier’s customers, especially those served by Charter Communications in states like New York, Texas, Florida, and California are only accelerating Frontier’s customer cancellations. Frontier’s cost consciousness and deferred upgrades as a result of its financial condition are only allowing cable companies to steal away more customers than ever, as the value for money gap continues to widen. 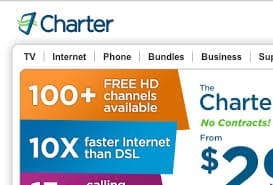 While Frontier has failed to significantly upgrade many of their DSL customers still stuck with less than 10Mbps service, Charter Communications is gradually boosting their entry-level broadband speed to 100Mbps across its footprint and selling it at an introductory price of $44.99 a month. Even Verizon sees the writing on the wall for the revenue prospects of landline service, especially in areas where it has not undertaken FiOS upgrades. Verizon DSL is still very common across its northeastern footprint, particularly in states like New York, Pennsylvania, Virginia, and Maryland. Upstate New York is almost entirely DSL territory for Verizon, except for a few suburbs in Buffalo, Syracuse, and the state’s Capitol region. Verizon soured on upgrading its copper facilities in these areas years ago, and has contemplated selling them or moving customers to wireless service instead. Verizon spokesman Bob Varettoni admitted Verizon’s strategy was to “sharpen our strategic focus on wireless,” which makes Verizon considerably more money than its wireline networks. Frontier cannot continue to do business this way and expect to survive. Investors have circled 2020 on their calendar — the year $2.4 billion in debt payments are due. Another $2.5 billion is due in 2021 and $2.6 billion in 2022, not including interest charges and other obligations. Refinancing is expected to get tougher at struggling companies and interest rates are rising. The pattern is a familiar one in the telecom industry, where acquirers like FairPoint Communications and Hawaiian Telcom spent heavily on acquiring landline cast-offs from Verizon. 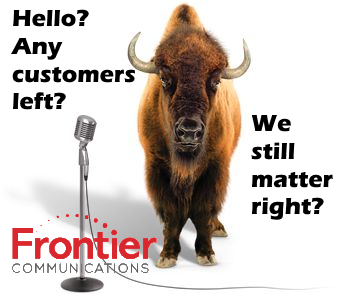 Customer departures, a financial inability to upgrade facilities quickly enough, and heavy debts forced both companies into bankruptcy, precisely where Frontier Communications will end up if it does not change its management and business practices. Don’t you mean “a small independent phone company in Rochester?” Frontier didn’t begin as SNET. What the frak are they doing? For the past couple of years I’ve been assuming the top executives are just trying to get payouts, then jump from the company, leaving all the customers and employees dead in the water. I mean rather than do all these expansions, they OBVIOUSLY needed to be upgrading what they had to fiber at LEAST by 10 years ago. AFAIK they’ve done NO upgrades ever. They just buy Verizon, and use whatever Verizon had. 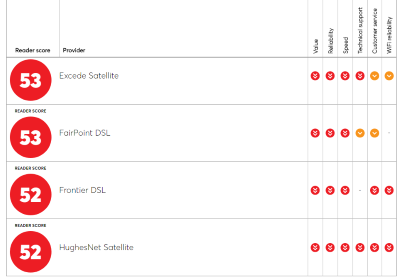 Frontier took over Verizon properties in 13 states, including my DSL account in Illinois. Took them 3 months to send me a bill, which meant that they didn’t know what they were doing. Fortunately, I didn’t have to pay anything extra. During the transition, my DSL sometimes jumped to 20 MB DSL(Instead of 3/.768). After about 2 weeks, it dropped back down to worse than the contract speeds, and consistently slower than Verizon’s DSL. Also, their customer support was terrible. As of 2017, Frontier only offers 6 MB DSL at my home. Comcast and a local fiber provider both provide 1 Gig speeds. I never understood Frontier’s strategy, as it always seemed to be many years(maybe a decade) behind in technology. Frontier has never offered a video product here, other than Dish or DirecTV. Frontier should have been spending big $ to upgrade their Internet speeds. Verizon had slowed any local CapEx once they knew that Illinois was on the selling block. We had major street construction that summer of 2010. Local town could not contact anyone at Frontier for weeks. Frontier also blew it by giving away potential CapEx with their overly high dividends. It seems that their only remaining customers want POTS for security systems, or have minimal residential Internet needs. After talking to others, Frontier continues to lose residential/business customers to Comcast, WISPs, and local fiber providers. The high dividends aren’t a problem anymore, but there’s probably not enough money to do more than pay off the interest. If they were smart, they’d stop messing around with Vantage (which is CapEx intensive) and just offer/resell sometime OTT like most smart telcos have pivoted to. Maybe try out a new B/OSS system in a few trial markets as well, since their IT is probably the worst in the industry. Probably any execs in Connecticut working there for more than 10 years should leave as they haven’t achieved anything during their tenure except license platforms from T and VZ. The scary thing is that Frontier has a huge cash flow. There are still enough customers that use Frontier because they don’t have a choice. “Cable” is a dirty word, but the value-per-dollar delivered by Spectrum, Comcast, or other “usual suspects” from the rouge’s gallery is dramatically better. There are many articles where people have done analysis on the cash flow situation; because the company is doing almost no investment, the $90 you pay for a landline + 1 Mbps DSL goes straight to the dividend and to the bond investors. Thus this sad, sick game will stretch into the 2020s. Frontier’s stock price has threatened to go so low (under $1) that it would have been delisted and become a penny stock trading on the pink sheets if they hadn’t done a reverse split a little more than a week ago. Good grief. If they still have money, they HAVE to spend…I mean it’s probably too late, but…what on Earth is wrong with these executives? I mean they get to just use the company for payouts, I guess, because ANYONE could see that you expand slowly, and you HAVE to upgrade your tech. DUH! My experience with Verizon was CONSISTENTLY HORRIFIC. The sheer incompetence broke my brain. They would screw up everything they possibly could, and several things you’d think they couldn’t possibly get wrong. And this isn’t just one homeowner speaking, I’ve set up Verizon service at dozens of address for myself, friends/family, and for work sites. I could tell you horror stories for weeks. While they’re not very good, Frontier has been a huge improvement over the inconceivable level of Verizon laziness, lack of communication or coordination, and utter incompetence that would make The Three Stooges blush. Good riddance! I’ve heard about the customer defections several times, and while it doesn’t match my experience, it suits me just fine… Frontier is only too happy to cut your rate to any price you name, for the next 12 mo, to avoid another customer loss. Reminds me of the good old days with Time Warner, before Charter bought them out and started strong-arming all their victims/customers. Roll with the punches, and take advantage of it while it lasts, folks. The other side may be more competent, but also more evil. They will not be the only company that will have problems paying for debt as rates rise and they have to refinance debt. Frontier seems to be only interested in acquiring other phone companies’ properties for the monthly income from subscribers of the phone and internet services. The cost of maintaining and upgrading those services don’t ever seem to come to the minds of the corporate officials who authorize the acquisitions. They are only interested in passing along dividends to stockholders – who now find their investment in Frontier stock is more risky than ever. I’m in WV where the 2010 addition of Verizon customers ruined our fairly steady “broadband” speed of 1344 Kbps / 128 Kbps until speeds are sometimes less than dialup!! Not only that – but the phone service has deteriorated back to 1950’s – 1960’s levels when we were served by a local area phone company and the phones were out of order nearly every time it rained. As I write this, the phone is without a dial tone – just as it was last weekend while the DSL is barely working (after midnight) after being out most of the day! Another thing… Citizens/Frontier used to have battery backup for our phones so that when the power was out we could call and report it or report it on the internet but they’ve done away with that option. Now, when the power is out, we’re totally isolated – no phone, internet and, especially, no 911 service! They’ve regressed and ruined what was a dependable, fully working communication system until it’s now a fair weather phone service with marginal internet service. Should they go bankrupt it might open the eyes of the governmental agencies who let them keep buying without maintaining what they originally had while we, the general public – customers of Frontier, suffer the consequences. In addition to subscribers, Frontier also screws its employees. Since the disastrous CTF acquisition in 2016, they’ve laid off thousands of FT and contract employees. Frontier reneged on promises to contractors that they would make them perm six months after hiring them. Later on, they either fired them on the spot, or extended their contracts a paltry three months at a time, over and over, until they were finally terminated. Entire floors, once bustling with workers, became ghost towns, and entire groups were dissolved. I guess the Frontier leadership thinks they can fire their way to profitability. All they’ve done is establish a reputation (in the IT profession) as a company to stay as far away from as possible.